ACH Payments 101: What is an ACH Payment? ACH payments are very common—if you’ve even received a direct deposit paycheck, you could be interacting with the ACH network without even realizing it. After reading this post, you should walk away with a firm understanding of what ACH means, the parties involved in an ACH transaction, and why businesses could benefit from ACH payments. ACH is an acronym that stands for ‘Automated Clearing House’. The Automated Clearing House is not a physical place, but rather a network that connects all banking and financial institutions within the United States. Think back to that direct deposit I mentioned earlier—whenever you receive that ACH transfer it is routed to your bank account using the Automated Clearing House, aka ACH network. 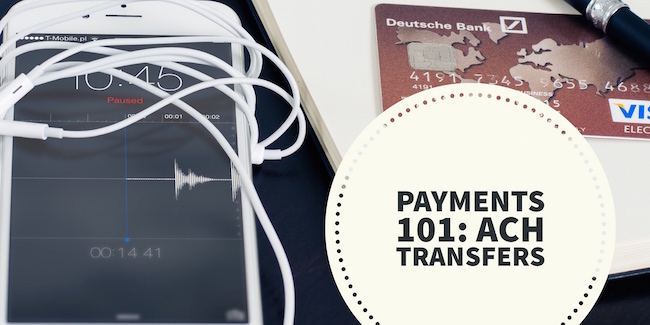 What is an ACH payment and transaction? ACH transactions are a form of electronic payment involving a few different players. First is the Originating Depository Financial Institution or ODFI. Additionally there is a Receiving Depository Financial Institution, also called the RDFI. The ODFI is the banking institution that initiates or originates the ACH transaction, while the RDFI is the banking institution that will receive the funds via ACH. One final player to get acquainted with is NACHA. NACHA is the non-partisan governmental entity that is responsible for managing the rules and regulations for the ACH network (not for credit card payments). How does an ACH transaction work? On to the meat of the matter, here’s how an ACH transaction works. We’ll take a look at two different scenarios, first when you’re receiving a debit to your account. When you make an ACH transfer to your electric company, for example, via ACH, it starts with your utility company’s bank sending an ACH debit entry to their ODFI. Next, the ODFI and RDFI “communicate” with the customer account (you) to ensure that funds are available in your bank account that’s being debited. If you have sufficient funds for the amount needed, then the transaction is processed and the funds are routed to your utility company’s bank account. However, if you have insufficient funds to cover the debit, the ODFI will receive a return code (more on that below). An ACH credit transaction to your bank account works similarly, just in reverse since you’re the recipient. Back to direct deposit for example, you provide your employer an account and routing number; when payday arrives, your employer’s ACH processor initiates a funds transfer via an ODFI. There are hundreds of ACH return codes out there, but in short an ACH processing return code is a “reason” for a failed ACH transaction. For example, if there are insufficient funds in a bank account that is being debited, the ODFI will receive a return code of ‘R01’. When they receive this code, they’ll realize that the reason the transaction failed was because there wasn’t enough money in that account. Here is a list of common ACH return codes and the reason a transaction may fail. How can businesses use ACH? The final question is, how can businesses use ACH payment processing? Any time money is moving, there is an opportunity for ACH to step in. For example, consider a marketplace paying out to their merchant base, ACH is a good option for this (as opposed to customer checks). If you’re collecting large sums from investors, ACH is a natural fit to move money right from their bank account into the investment. As a business, there are a few ways to tap into the ACH processing network to integrate this type of payment into your standard business procedures. You can reach out to a bank (or any other financial institutions) and learn more about their ACH services or you can work with a technology company that provides easy access to the ACH network. Consider Dwolla for example, an ACH API that acts as an easy on-ramp to the ACH network. To learn more about ACH payment processing, head to NACHA’s website. Here, you can find usage statistics, rules and regulations, and more details on the ins and outs of the ACH network.